Microsoft has released Visual Studio Community 2013, a revamped edition of Visual Studio Professional 2013 which is free for individual and small business use (teams of up to five people). Bundled tools include Peek, Blend, Code Analysis and full C# refactoring, and if that’s not enough then there’s full access to Visual Studio’s 5000+ extensions. This does make for an absolutely huge product. The installer is a tiny 1MB, but it may have to download gigabytes of files, depending on your installation choices, and that’s going to take a while. When we tried installing every feature, for example, installation took around 2 hours with a basic (8Mbps) broadband connection, grabbed 15GB of hard drive space, and added 40+ components to the "installed application" lists on our test PC. Visual Studio Community 2013 does put an enormous amount of power in your hands, though, and the licensing terms are generous, too. Individuals and up to five people within non-enterprise organisations can use the product to create free or paid applications, and everyone else is able to use it for non-commercial purposes (teaching, open source products). Community is a must-have for the serious Windows developer on a budget, then, but if you need a more leading-edge product then Microsoft has also released Visual Studio 2015 Preview. 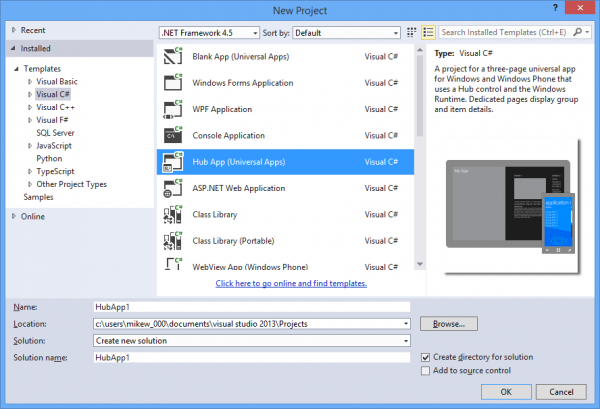 Highlights for us are a new support for building Android applications using C++ based off of Clang and LLVM, and an excellent Visual Studio Android emulator, but if you’re interested the Visual Studio Blog has more.